So last week's post presented a less-obvious-than-it-sounds message of day being different from night because our eyes are drawn to different things. I used some of my HO scale miniatures to illustrate some of these differences. But now I need to take it a step further by 'going full scale' and actually showing the reality of what it means to ride at night without taking any precautions. Since I didn't want to communicate this with my obituary, I decided not to put myself or any friends at risk with this experiment. The first thing I needed to do was find a bike. In my basement, this is not difficult to do. And what a bike it is. This bike was a throwaway from the great guys at the Trafigura Work & Learn Center at Domus. It is a Saint Tropez, and an interesting design quirk is the disc brake in the back and the fist-sized mechanism that goes with it. I may do a real Saved from the Scrapheap post about it later, but for now I need to go over why I chose it for this post: it's not a dark color, but it isn't a bright color either. And there are no reflectors on the bike except for the ones on the pedals. I've seen plenty of bike-shaped objects moving around Stamford in the dark without reflectors, so I figured this would be a perfect stand-in. Next, I needed a way to keep the bike upright without modifying or damaging it. Lucky for me, a drawer in my welding room yielded some Frame Maker brackets, and I was able to use one to attach a set of handlebars to the underside of the frame. It took a couple of tries, but I eventually got it to stay upright. Now, I needed to build a cyclist. I wasn't sure how to go about doing it, but because my welder was out of service (more on that in a week or two) I ended up finding another post to put in the seat tube. When I removed the seat itself, I had a nice, ready-made base to attach a torso, which I made out of bolted aluminum, pipe insulators, and plastic lids. So far, I was pleased; the rider would sit where it was supposed to and I didn't have to permanently alter the bike to make it stay there. Now I needed to put a shirt on it. My first choice was a T-shirt featuring an iconic vehicle - the Reliant Robin Space Shuttle - from one of my favorite TV shows - BBC's Top Gear. Unfortunately, I realized I needed something with long sleeves if I wanted to avoid building arms for the rider. So I located a boring, dark blue T-shirt. Rather than bias the experiment by giving the cyclist black pants, I elected to use some light green ones that I sometimes wear in the shop. Putting foam pipe insulators in each pant leg allowed me to bend the fake legs to put them on the pedals. When I put the seat post through the open fly (which is just as weird as it sounds) I attached the sleeves to the handlebars with spring loaded clamps and put a black helmet on it to complete the look. I took a step back and immediately thought I had cast Christian Bale's character from 'The Machinist' as my cyclist. In a perfect world, I would have waited until sundown that day and carried the whole thing outside in order to take the photographs. 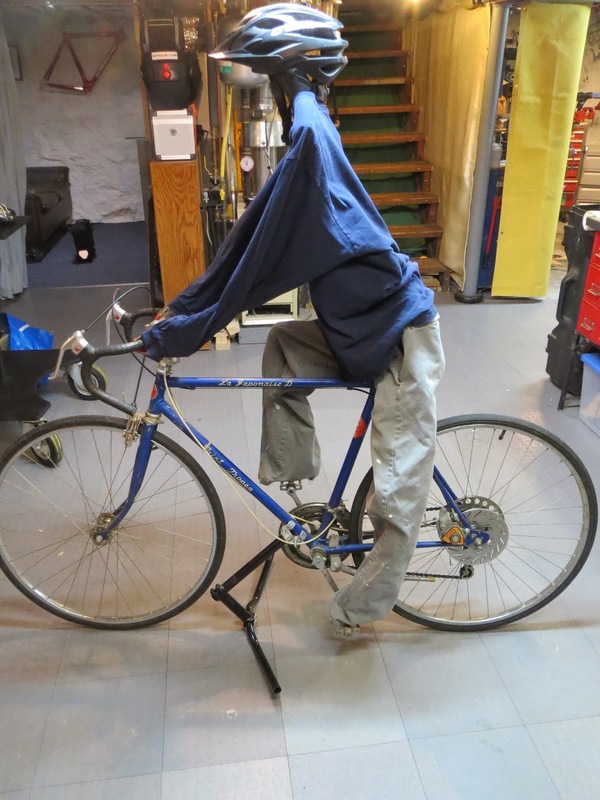 But due to poor planning, this DIYBIKING.COM version of 'Buster' - named DIYBiker - stayed like this, on the bike in my basement, for two days. Just at the foot of the basement stairs and steps from my home office door, I'd often forget it was there and it would startle me a bit when seeing it. Finally, I came to a night I could deploy: temperatures were in the high thirties/low forties and not far from my house there's an access road to West Beach which I thought would be the perfect place to do all this. No street lamps and little light from buildings, so at dark it would be a good road. So I took DIYBiker off the bike, broke him in half so he'd fit in a blue IKEA bag, and put him in the back of my Honda Element. The bike was a bit awkward carrying it up the basement stairs, but it fit in the car easily as well. When I parked, I set up some Christie Administration Approved traffic cones behind my car and put the four-way flashers on. I then set up DIYBiker as the last of the light drained from the sky. Then I went back to my car and looked at my creation through the windshield. I realized I had my 'money shot' as I had just happened to place the cyclist at a distance where you could just barely realize that you were looking at a someone on a bike. Remember the image below: when you dress for night riding you may look loud standing in front of a mirror but below is what the driver sees. Using my Measure Master, I found there was exactly 71 feet between my car and DIYBiker. I know other cars have dirtier and less effective headlamps, scratched windshields, poorer vision, etc. but for the purposes of this post, it would have to do. I then left my car in the road and headed to DIYBiker to attach a basic red reflector to the back. I walked back to my car, returned to the driver's seat, and snapped another picture. See that little red dot? That's the reflector. And if you take absolutely no other precautions other than the reflector I won't lecture you, but I will say that that little red dot is what you are counting on to save your life. Now excited with what I had found out so far, I jumped out of the Element, ran to DIYBiker, and removed the reflector to replace it with a cheap red bike light. I set it on 'constant' so it would get in the shot. I jogged back to the car and took the usual photograph. I thought it seemed brighter than the reflector, and just to test the overall visibility I switched off my headlights for a second. Okay, so it's not the brightest bike light I've ever seen, but as I wasn't willing to drag DIYBiker forward or move my car backward, I did figure a driver would definitely be able to become aware of a cyclist further away than 71 feet - and thus be able to react to the cyclist sooner than if the biker had little or no reflectors. I had other, better quality bike lights to test as well as a reflective trouser guard and a highligher-yellow jacket I wanted to put on DIYBiker…but then the police arrived. I assumed not many people would be at the park at this hour, but while I was taking the above photos of DIYBiker, this particular officer was already in the park and came across me while I was getting ready to put a bright vest on an artificial cyclist. He rolled down the window of his patrol car and asked me politely and professionally what I was doing. It's not always easy keeping a straight face when I tell others what I do, but I did okay as I explained that I was doing this for safety reasons. His eyes flickered from DIYBiker to me and back again. For a moment, I expected him to administer a sobriety test. Instead, he explained I needed to leave. My car was parked in the road, which made me a safety hazard. As if on cue, a car entered the park and paused at the rear of my SUV, but in fairness (to myself) the driver was probably more intimidated at the sight of the patrol car than of a nine-year-old Honda Element. I apologized, and the officer took mercy on me by granting me permission to resume my experiment up at the parking lot. I packed up DIYBiker as the officer watched silently. But while carrying DIYBiker in one hand and the bike in the other, the bracket I had made earlier to keep the Saint Tropez upright twisted out of position and fell apart. When I got to the parking lot, I discovered a vital piece was missing. As it was getting late and windier (making it impossible to resume the experiment with just the kickstand) I made a defeated drive back home. The next day, below-zero temperatures and over seven inches of snow blanketed Stamford, thus changing the conditions of my lab. From a glass-is-half-full point of view, I established a motorist would have to be at least 71 feet from a cyclist at night in order to see him or her. But I was doing this in a parked car. When a car is moving there are other factors in play. I now needed to illustrate what it means when a car is approaching a cyclist at different speeds. And I planned to do it in a way that would involve math but would not draw the attention of rozzers. Tune in next week. Thanks for reading and thanks for riding.